This is the common scenario for most of the tea lovers. Actually, we don’t know or don’t want to indulge in tea-loving. Whatever we get just sip and forget about it. But whenever, we get chance of good aromatic tea we just say “Whah! what a tea” and that happens rarely in our life. We generally struggle to have a good sip of tea, and that happens due to access to good quality tea and we stick to common CTC’s and sometimes leaf teas available in our market. They are cheap and just a tea with color. But, to get the aroma of tea you have to pinch your wallet. A good quality aromatic tea will cost you around Rs. 290/- for 100 gms. But, where to get Tea of my choice? But what is the best place to buy tea online? That question also haunted my mind. 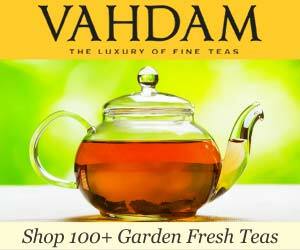 But, I found my answer and that is straightforward to say the name of “Vahdam Teas“ – an online shopping website only dedicated to tea lovers with varieties of quality teas (Black, Green, White, Oolong) from India’s topmost tea estates. If you are looking to buy Darjeeling tea online I especially recommend this site for those who love to sip Good Quality Tea, no CTC’s please!, because here you rarely find CTC’s :).